Photo shoot on the farm. Okay, well, maybe we didn’t exactly have a photo shoot on our little farm, but there were a few pictures taken. The UPS delivery man stopped by yesterday afternoon to drop off a couple of packages (one was a Brinsea mini incubator and the other. . . well, I’ll do a post all about it in a few days). This particular UPS man has apparently driven by many times while working and each time he drives by, he looks for the turkeys (Jim Bob, Snoody, and Pattycake). 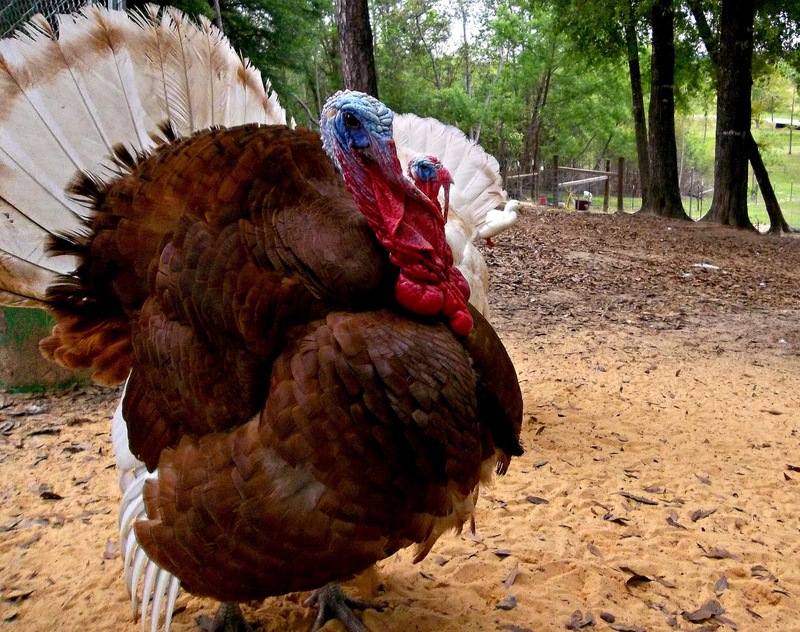 Now, Jim Bob and Snoody (the two toms) are the bosses of our farmyard, and they spend almost all day long strutting and showing off to anyone that’s willing to stop and admire them – most especially Jim Bob. I know most people describe peacocks as being overly vain, but peas have nothing on Jim Bob. Before UPS Man left, he asked if he could take a few pictures of the turkeys to show his daughter – she had asked for one if he ever stopped at our house. Of course, our two showoffs were more than happy to pose for him. Jim Bob with Snoody just behind him. Previous post: Uh-Oh and Woohoo all in one day. Next post: Happy Birthday to ‘Gator and ‘Bear. We are getting our breeding stock of bourbon reds next month. Your guys look beautiful! I just came across your blog and I haven’t had the opportunity to read everything yet. Are you raising yours for food, pets, breeding? I will definitely be checking back!